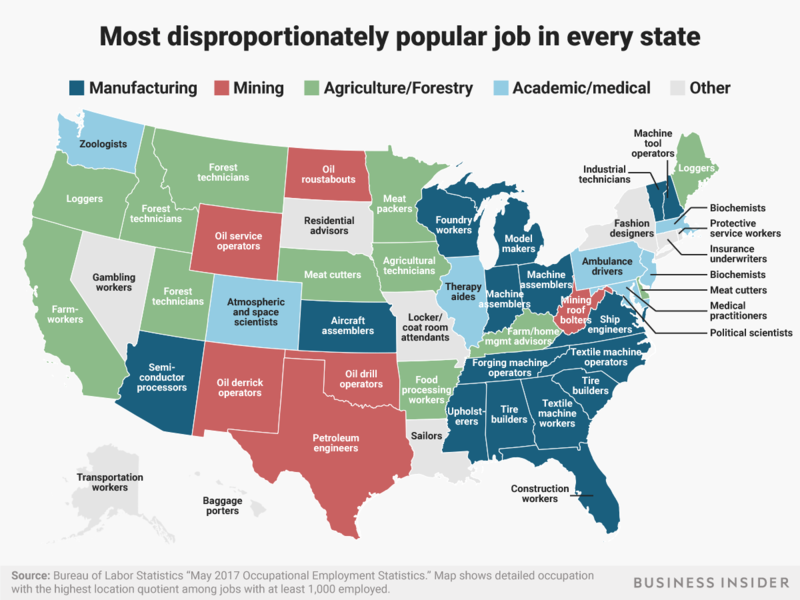 Popular jobs can vary by state based on occupation distribution. For geographical and economic reasons, certain jobs are concentrated in different pockets of the United States. The Bureau of Labor Statistics provides data on what jobs are disproportionately concentrated in each state. For geographical reasons, certain jobs are concentrated in different pockets of the United States. The environment dictates where certain jobs can be due to the location of natural resources like oil, coal, or natural gas. Careers in ship and marine engineering obviously require proximity to bodies of water. In the same vein, agricultural occupations rely on sprawling farmland for crop growing. Using recently released data from the US Bureau of Labor Statistics, we took a look at the most overrepresented job in each state and Washington, DC, among professions with at least 1,000 employees in the state. Each of these states has more people working these jobs per capita than the nation as a whole. This is not the most common job in every state - that would be far less interesting, as the most common job in 38 states is retail salesperson.